After attending Dell World, Dell’s first ever user conference a couple of weeks ago, it’s apparent that Dell’s progression towards becoming a pivotal vendor in what it terms the “virtual era” is well underway. And, last week’s announcement of Dell Boomi’s Fall 2011 release provides a prime example of how Dell is crossing the chasm from a product-centric hardware vendor to a solutions and services provider. For the past few years, many pundits have derided Dell as a one-trick pony. Sure, it totally disrupted the PC and then server markets with its direct model, and redefined operational efficiency in the hardware industry. But could it ever hope to compete in higher value, higher margin software and services businesses? With Michael Dell back at the helm, the vendor began publicly charting its path to the virtual era in 2010 (see my March 2010 post Dell 2.0: Top Takeaways from Dell’s Virtual Era Event) and has been executing on this strategy via both organic growth and strategic acquisitions. Most of these acquisitions (Perot Systems as the exception) have been smaller companies with innovative products and high-growth rates. Moving from product to a solutions orientation. In the past, Dell’s identity has revolved around boxes—from PCs to servers to Streaks to big screen TVs. While Dell vociferously reiterated its ongoing commitment to the PC, it put the spotlight on its growing ability to provide businesses with end-to-end, heterogeneous solutions, not just piece parts—and to satisfy market demand for better, more cost-effective and easier to deploy, use and manage IT solutions. Building out its cloud-cloud-cloud plan (my phrase). The shift to cloud computing—public, private and hybrid—features prominently in Dell’s solution equation. Dell’s sales team has been using Salesforce.com for a few years now, and is also a major user of Chatter and Radian6. Dell has become a cloud convert, and figures plenty of other companies will want to make this move too. Dell has invested $1 billion dollars to build and buy a cloud computing portfolio to help customers take advantage of cloud computing. Dell’s portfolio includes public cloud, private cloud and service solutions (such as Boomi, which I’ll get to in a minute!) so customers can move to the cloud and still leverage their existing IT investments. In Michael Dell’s words, Dell wants to “give them the bridge to the past and a path to the future.” One example is the new enhancements Dell has made to its Virtual Integrated System (VIS) Architecture, which helps extend virtualization benefits within a customers’ existing infrastructure. Transforming from snubbing the channel to become a channel-friendly vendor. In the past, Dell’s most unique characteristic was its successful direct sales model. But, while that works fine for selling hardware, it won’t allow Dell to move up the solutions stack. Dell has recognized the important role that local partners play in creating value-added solutions that work with customers’ existing investments. It has been actively seeking partners that add solution value, and will have over 100,000 by the end of October. Pioneering in social media. Dell has been breaking ground in using social media for input, dialogue and interactive marketing. After getting badly burned in the Dell Hell support crisis in 2005, Dell licked its wounds and has moved on to become a leader in building extensive social media capabilities to help it tune into customers and become a social media poster child. Dell just keeps raising the bar in social media, as evidenced by its Social Media Command Center. 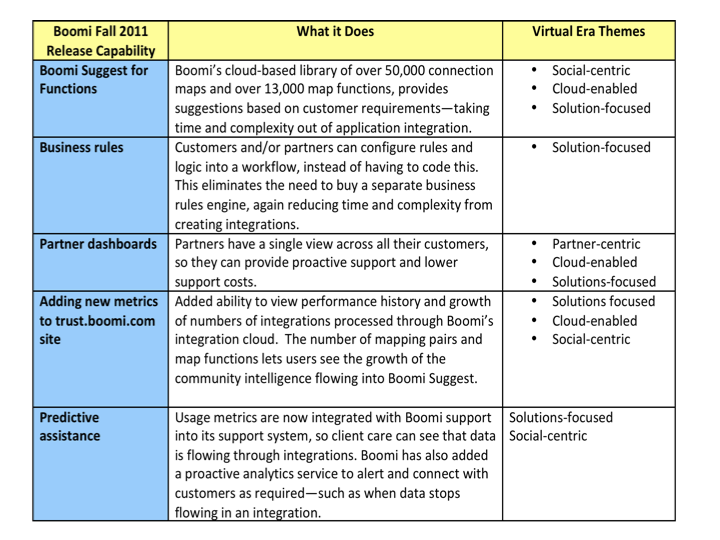 Dell’s latest release of Boomi highlights Dell’s execution on its Virtual Era strategy. Boomi, which Dell acquired in 2010, is an 11-year old integration company that has been steadily moving to expand its cloud integration services. Boomi’s cloud integration service helps companies more efficiently and affordably integrate cloud and on-premise applications—across different locations, networks, clouds and companies (see Dell and Boomi: Doubling Down on Integration for more details). Boomi’s approach features a cloud-based integration hub that provides customers with integration as an online service. With Boomi, companies can integrate different cloud and on-premise applications across geographically dispersed locations. Boomi’s visual interface relieves customers from complex code-writing and scripting. With this release, Boomi has added several new capabilities that correspond directly to Dell’s broader overall Virtual Era vision, as shown in Figure 1. Dell is moving beyond its direct, hardware-centric comfort zone and making good progress on its Virtual Era strategy, as exemplified by Boomi. Serendipitously for Dell, HP has been pre-occupied with and increasingly defined by PC unit flip-flopping and a game of CEO musical chairs. HP’s diversions not only help boost Dell’s current client and server opportunities, but also give Dell more running room to move ahead with its long-term strategy. While some out there may still view Dell as one-trick pony, I see ample evidence that Dell is well positioned to succeed in its next race. This is a good summary of how Dell is morphing as a broad-based solution provider for cloud computing. Thanks for reading and for your perspective!